For chemical feed applications where chlorine is used extensively‚ we stock only the very best brands and grades available. In unmanned facilities‚ you need tubing you can trust. Our premium industrial-strength tubing is extruded from high-quality resin for long-term strength and durability. Its resistance to stress cracking greatly exceeds that of ordinary tubing found at local hardware stores. With this high-quality tubing‚ you’ll see longer life‚ less maintenance and less downtime. 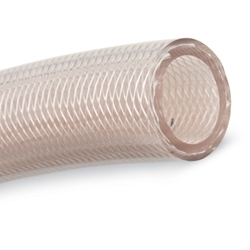 Clear braided PVC hose works great in chemical transfer applications. When determining size‚ remember that tubing is measured using OD (outside diameter)‚ vs. pipe and hose which are measured using ID (inside diameter). Note: Tubing is sold only in the prepackaged lengths.